Proper storage of firewood is important to prevent pest problems this winter! Many families in Maine, New Hampshire and Massachusetts enjoy their winter fires to help keep their home warm and cozy. But did you know that many New England homeowners can introduce pest problems by storing their firewood in the wrong places? We wanted to share some tips on where not to store your firewood and how to avoid winter pest problems. Inside the home – Sure, keeping a stack of firewood sitting inside your home seems like a great solution when the temps are freezing, but this could pose serious pest problems. Once common firewood pests including spiders, carpenter ants, beetles, and other insects nestled in your firewood get warm, they’ll become active in your home. Close to the home – Another common location to store firewood is right next to the entrance of the home or stacked near the home. Although this will save you some time and hassle in the winter months, it’s not a good idea to store firewood so close to the home. All it takes is a tiny crack, hole or opening along the exterior of your home for firewood pests to get inside and then you could find yourself facing a pest infestation. 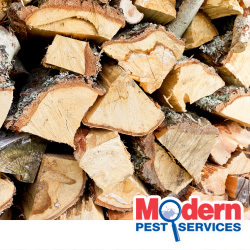 It’s recommended that firewood be stacked at least 20 to 30 feet away from the exterior of the home to keep pests away. Garage or basement – Instead of building a wood shed designed to store firewood, some New England homeowners opt to keep their firewood stacked in their garage or basement. And as mentioned before, this practice is also going to make your home vulnerable to pest problems. If you’re concerned about keeping snow and moisture off the wood, keep the firewood securely covered outside rather than having it sit in the garage or basement attached to your home. If you do happen to notice any pests problems as a result of your firewood then allow the New England pest control pros at Modern Pest Solutions help you get rid of firewood pests. With our experienced and trusted pest management professionals, as well as our ongoing Home Care Advantage program, you can be sure that your home in Maine, New Hampshire or Massachusetts will be protected from common pest threats, including those from your firewood. To learn more about protecting your home from firewood pests, please contact us today!